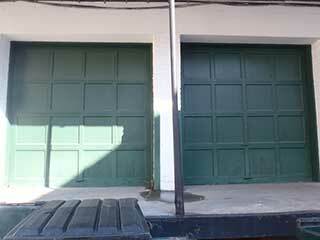 Steel is one of the most popular and commonly used materials for garage door panels. The price of panels made from this material varies depending on their design. You should note that steel is not only used to make the exterior surface of the door but also the interior part which includes some of the mechanism. Panels made of stainless steel, for example, are actually more durable than wooden ones, and their ability to resist rust can make them an excellent choice for many homeowners. Stainless steel is a metal that is ‘inoxidizable’. This is a scientific term used to describe the inability of this type of metal to react with moisture and oxygen and develop corrosion. In simple terms, stainless steel does not rust, which means it is a great choice for homeowners who live in moist climates. This type of door material is less expensive but still very strong and durable, which also makes it a great choice for budget conscious customers. Maintaining doors of this type is very simple, and all you really need is to clean them routinely to ensure they don't start to accumulate dust and dirt. The fact that stainless steel is particularly strong and solid in nature makes panels made from this material very had to repair when if they get dented. This factor makes fixing them potentially very expensive since you’ll either have to weld the damaged part, making it look peculiar, or remove the whole panel and replace it with a brand new one. Knowing which door material is the right one for you isn't always immediately obvious, and trying to decide between the different models and collections, not to mention brands, that exist out there can be very confusing. Our team at Garage Door Repair Walnut Creek will be happy to help you make this decision. Feel free to contact us for more information.